Saw several of these near Alma (NB) on walking trail. Is it a type of Amanita? Visited Fundy National Park in September and took a load of photos of Fungi, which I have since not been able to identify. This is a new hobby for me and I now recognise that I need to provide more info in order to assist ID. 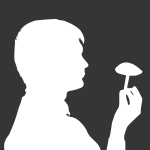 I have looked through Roger Phillips book on "Mushrooms" without success. I would value any suggestions about this specimen. Plenty of others in the pipeline which I am also confused about! Thank you.